NARS #15 smudger brush, Chanel #26 contour/shadow brush, NARS #14 pointed blending brush. How-to: 1. I started with Urban Decay primer potion (original) applied all over the lids and applied the pale matte shadow all over lids to help other shadows go on better and to help with blending the shadows. 2. Using a flat eyeshadow brush (Chanel #25), apply the darker taupe-purple shadow all over the lid but stopping short of the crease. 3. Using a fluffy shadow blending brush (NARS #13), apply a soft wash of the warm brown shadow - MAC Saddle - along the crease, blending the edges of the darker shadow. 4. Using the pale beige eyeshadow on a flatter blending brush (Hakuhodo J5523), buff the edges of the warm brown shadow applied earlier in step #3. This helps take off the harsh edge the shadows and blends the colors together better. 5. Apply the dark navy liner along the upper lashline. I have big round eyes which I don't want to magnify any more, so I apply the liner only on the outer third/half of the lashline. Pick up some of the darker taupe-purple shadow on a small shadow smudging brush (I used Chanel #26) and soften and diffuse the navy liner. 6. Apply the same navy liner on the waterline. Using a smudger/pointed blending brush (NARS #15 and #14), place MAC Saddle along the lashline and blend it slightly. I also buffed a bit of leftover eyeliner/shadow on the smudging brush from step #5 along the outer third of the lower lashline to give just a hint of darkness. Curl lashes and apply black mascara to finish the eye makeup. Clean up any eyeshadow fallout and finish the rest of the makeup. In my case, that involved a lot of concealer and my usual Chanel Perfection Lumiere foundation. I used Rimmel Stay Matte powder along the center of my face and along the sides of the nose and Chanel Les Beiges powder along the outer edges. For color, I used the peachy pink Chanel Fleur de Lotus blush on the cheeks and for the lips Chanel Charactere lipstick topped with Chanel La Distinguee to give a soft neutral but not zombie-looking lip. Sephora lip brush from a some random mini set, Ecotools smudger eyeshadow brush from THIS set. 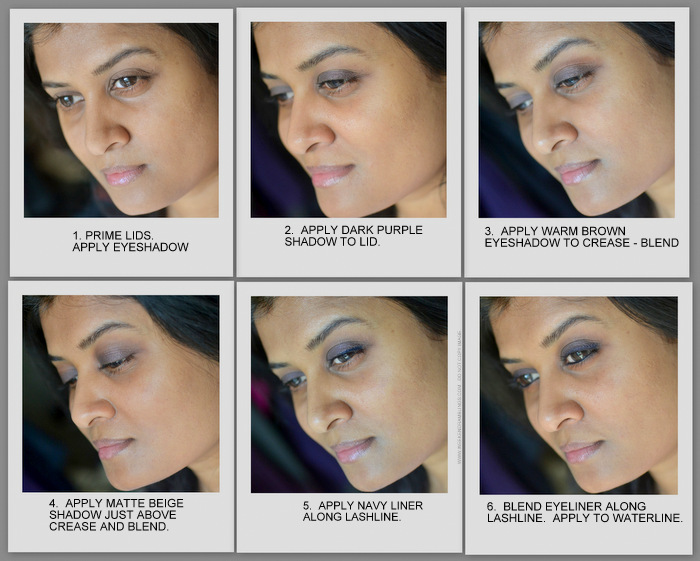 MORE MAKEUP TIPS AND EASY HOW-TO'S HERE. I love this look, and will definitely be trying this!! Isn't Nars Madrague just one of the greatest unsung heroes of all time? The darker colour is perfect for crease/blending and the lighter as a highlight, for medium tan skin then. When I travel I take a Nars palette + Madrague. I can't believe how light and pretty Caractere looks on you; on me it is really a goth colour. I LOVE the formula of Madrague..is such simple colors but they are nicely made, aren't they? WOWWWW. serious drool worthy stash!! !